I had proffered a 2324.00 Hidden Pivot here yesterday as a swing-for-the-fence number, but during this morning’s weekly tutorial session — attended by a record 30 webinar grads! — we were able to identify a new and even more ambitious target at 2403.30. Judging from the way buyers ripped through the red line (see inset), a midpoint ‘hidden’ resistance at 2213.15, I’d estimate that the 2403.30 target has about a 70% chance of being reached. 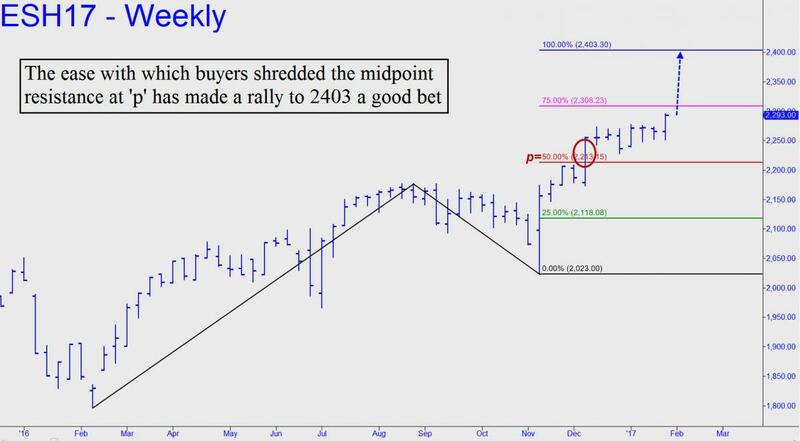 If so, the move would equate to a 1000-point rally in the Dow Industrials, to around 21,049. This scenario seems implausible with a housing bust shaping up in the background. Existing home sales fell 2.8% in December after rising for three consecutive months. The moderate strength in Q4 2016 is attributable to buyers’ eagerness to beat a further rise in mortgage rates, which have already climbed by 70 basis points from their 2016 lows. It seems all but certain at this point that 2017 home sales will fall short of last year’s mark — perhaps far short. As much could be said about auto sales, which will be coming up against 2016’s record 18.4 million vehicles. Under the circumstances, we might infer that the stock market is out of its ever-loving mind to be trading at these levels. Even so, although I trust my judgment about the shakiness of the U.S. economy, I trust my technical forecast even more. If that makes me the most bullish permabear in the guru world right now, I’m quite comfortable being out on a limb.